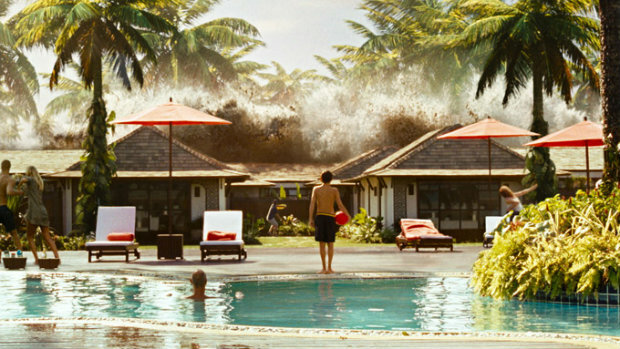 Come for the tsunami, stay for the tsunami. Outside those mind-mangling minutes of unadulterated mayhem and unmitigated annihilation, The Impossible nearly drowns in an ocean of melodramatics. Vacationing in Thailand at the most inopportune time in recorded history, a family of five - headed by Naomi Watts and Ewan McGregor - finds themselves facing one of mother nature's most devastating and earth-eradicating events. On the morning of December 26, 2004, triggered by a magnitude 9.1 earthquake, a series of tsunamis smashed into Southeast Asia, taking some 227,000 lives with it. The Impossible drops you right in the middle of it – you'll feel its hellacious fury. Arising out of this Indian Ocean, a monstrous wall of water wipes out everything in its path – palm trees topple, power lines crumble and a sea of debris envelops all. You'll swear you're watching found footage of the sheer horror, director Juan Antonio Bayona (The Orphanage) kills it – figuratively. And then comes the mushy mush. Watts and her eldest son (a sensational Tom Holland) are left to muck about the wreckage as they hunt for the remaining three members of their family. With Watts' leg gashed up something fierce, the pair ends up at the local hospital and thus begins the exhaustive wait for the inevitable reunion between the two factions of their clan. Mirroring what went down in Denzel Washington's Flight, The Impossible is pretty much shot once it hits the 30-minute mark. Where Flight soared solely when it crashed, The Impossible is immersive only when it's fully immersed – literally.